For the purpose of this intervention, I selected the pedestrian underpass walkway on Wellington, north of Rue Congregation. I chose this site because of its history, underneath the railway, and the importance of Wellington to the Pointe, while also being, for me, a not-so-nice place to walk through. The tunnel is cold, and dark, the cars zoom by quickly, and there isn’t a direct, safe way to cross the street to get to Parc Congregation. It is, to me, a place that I would not want to pass through during the nighttime. Through my research on Pointe-St-Charles, I have found stories of women and girls who have gone missing in the area, notably Jolene Riendeau, Sharon Prior, and Tammy Leaky. In my intervention, I wanted to touch on the Wellington underpass as a space to discuss these missing women and girls, and violence against women in public spaces. Sharon Prior, for example, went missing at the age of 16 near her home on Rue Congregation. Through these stories of missing women, and also thinking about the current activism around Missing and Murdered Indigenous Women of Canada, I have noticed that there is often community action against these violences – as seen with the Jolene Riendeau case, which received help from St. Columba House, whose volunteers postered for the missing girl, and where a vigil was hosted 10 years after her disappearance. The articles that we read in class, “The Early Years” and “Women Finding a Voice,” by the CourtePointe Collective first introduced me to the activism of women in Pointe St Charles, which was in line with women’s activism happening across Canada and Quebec, taking full swing in the 1960s and onwards. In the anthology Minds of Our Own, the author from the article “Changing Times” begins with a quote from Adamson, Briskin, and McPhail: “In 1965 in Canada, there were few women’s organizations, no women’s bookstores (because there were almost no books about women) and no women’s studies courses in schools and universities.” This quote illustrates the changes which have since occurred in society (though there are many more strides to make). Finally, through my research, I became interested in the organization, Madame Prend Conge (MPC). MPC’s mission is to break women’s isolation, fight against poverty and violence, improve women’s living conditions, and to promote equality in society. The organization, founded in 1979, offers services ranging from a daycare, computers, a relaxation room, refreshments and a documentation center. They organize weekly activities such as fitness and art classes, and discussion groups on topics such as gendered violence, sexuality, housing, stress, and advocacy, and collective actions such as the March Against Women’s Poverty. 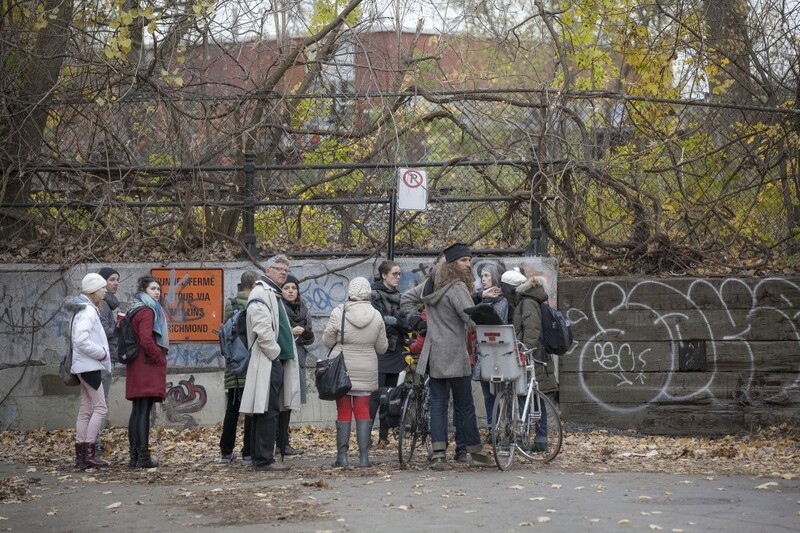 The class met near the Wellington underpass, by Rue Congregation. There, I started with reading Si Transken’s words, selected from her personal essay, “Reclaiming Body Territory,” on the topic of gendered violence and abuse. Afterwards, I explained the contexts which I have written above. Afterwards, I discussed notions of safety and danger, such as the cases of women and girls who had gone missing in the area. We discussed women’s bodies in space, and women’s activism – the mobilization around Parc Congregation. From there, we walked onto Rue de la Sucrerie, and down Mullins. We stopped for a few moments at the bottom of Shearer, where there was once an underpass walkway. We discussed how women in the Pointe fought to close the underpass, as it had become a site of danger. Afterwards, I took the class to MPC. 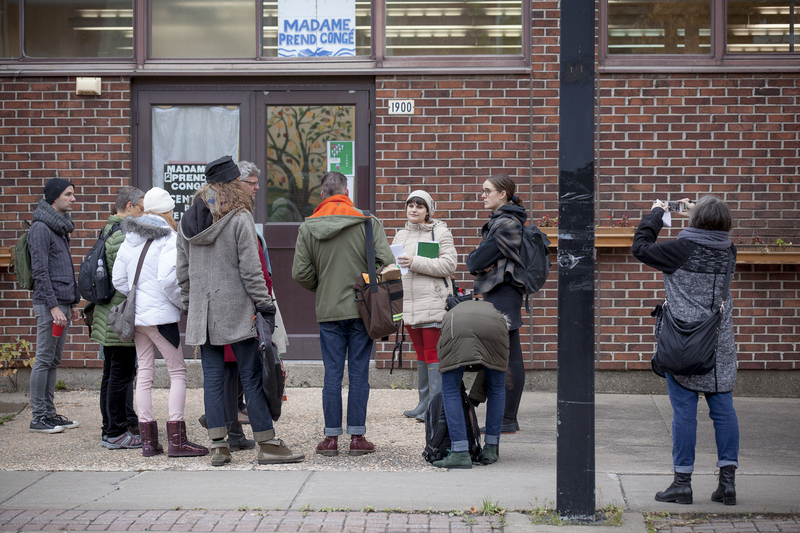 Before entering through the organization’s doors, I gave a brief explanation on the school inside which the organization is located, Ecole Charles-Lemoyne. Micheline Cromp, the coordinator of MPC, met with us upon entering the organization. Micheline showed the class their facilities, and then we convened in one of their workshops rooms, where we had a discussion with Micheline on the organization and its activities in the community – such as their classes on women’s self-esteem, art and fitness courses, and anti-violence workshops, as well as their activism against women’s poverty. Micheline also introduced the class to two women from the community who currently partake in some of the courses, which they both said have actively allowed them to feel more self-confident. We discussed a number of issues concerning housing, poverty, isolation, access to affordable courses, and current activism within the organization. Micheline and the members of the organization were very generous with the information that they gave us. Special thanks to Micheline Cromp, the women of Madame Prend Congé, and David Ward.